Product #598 | SKU E-HL9 | 0.0 (no ratings yet) Thanks for your rating! With its high capacity and high load discharge of 10.0 Amps at 120W, the E-HL9 is an all-round top performer. Our exclusive PowerLink connects two E-HL9 batteries for a total power capacity of 176Wh. The 5 LED power status display gives an accurate reading of capacity in 20% increments. 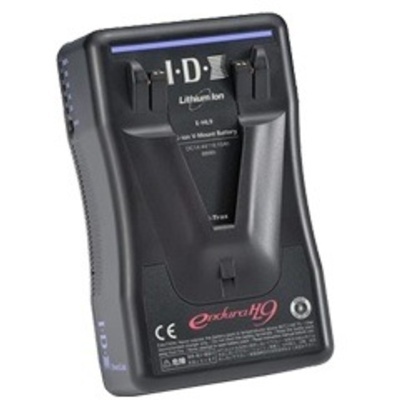 The E-HL9 supports Digi-View for reading battery levels in many of today’s camera viewfinders. Battery Management System (BMS) can be used for enhanced diagnostics and a comprehensive review of the battery’s history of use. This is an accurate display of the E-HL9’s remaining power. Its 6-step LED status displays capacity remaining in 20% increments plus the last 10%. Visually and instantly indentified at any time or shown in the camera viewfinder via Digi-View.